Here at FCG we try our best to provide an infrastructure that enables and encourages our building-users’ green behaviour in the workplace. In addition to separating general waste from paper and mixed recycling, we also recycle batteries and toner cartridges. 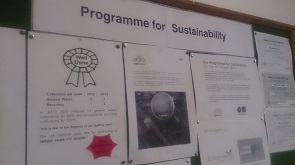 As well as providing these services we have placed posters in communal areas promoting energy efficiency in our kitchens and offices, and explaining exactly which items can and cannot be recycled. These posters serve to remind our long-term tenants of our recycling policy, and can also be used as a guide for temporary productions and those who are new to the building. As we aim to become a cycle friendly employer, we’ve recently installed a bike shed in the North Courtyard along with five pool bikes, courtesy of the Glasgow Bike Station. We are in the process of completing a wet/dry room, with lockers for cyclists to store their gear, and also have plans in place to provide shower facilities in the near future. We hope that these improvements, along with the better weather, will encourage building-users to leave their cars at home and cycle to work. In addition to holding one-off green events, such as the screening of More Than Honey, we hold quarterly ‘Green Sub-Group’ meetings with our permanent tenants. These meetings allow us to exchange ideas and gather feedback from building-users. We also monitor tenants’ performance with a star chart that records positive behaviour, such as bringing toner cartridges down to reception for recycling, and negative behaviour, such as failing to turn off appliances after use. As an incentive we award the tenants who have performed the best, or improved the most, with a prize at our Sub-Group meetings. All of our invoices are sent electronically. For all the latest sustainability news at FCG please subscribe to our PFS blog.